Welcome to the scenic mountain town of Prescott and the award winning Prescott Hampton Inn. 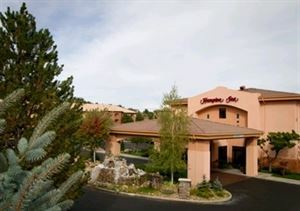 Known for our friendly, family-like atmosphere the hotel is located in quiet surroundings, with pine trees and mountain views. Experience comfort and convenience and make yourself at home in our warm and welcoming lobby. Check your email or print boarding passes in our free business center or host a meeting in our well-equipped meeting room. Wake up refreshed and start your day right with Hampton’s free hot buffet breakfast and delicious waffles. If you are in a hurry, make sure you take a free Hampton On the Run Breakfast Bag, on your way out the door from Monday to Friday.